When you wish upon a star, you get a lot of emotional scars. Does anyone know if there have been any actual good adaptations of Pinocchio since the first Disney one? I’ve seen a few of them – including Roberto Benigni’s atrocity – and even the ones that have tried to be more faithful to the original novel were pretty horrible. 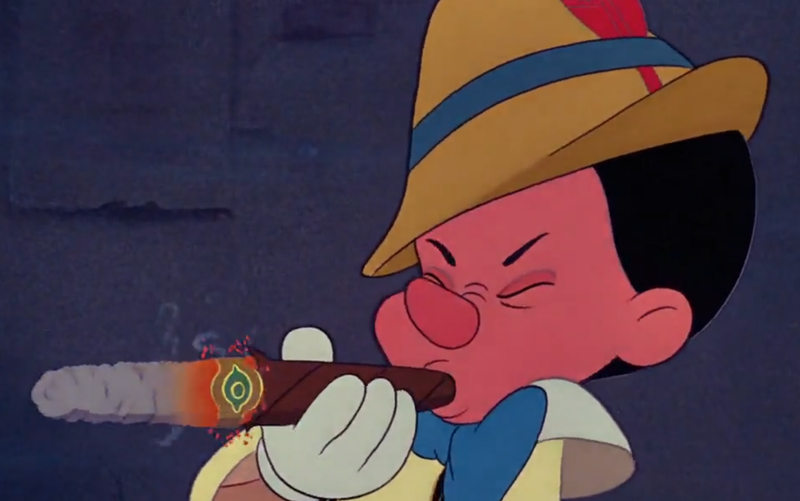 In fact, I’d be surprised if anyone even heard of any other adaptation of Pinocchio besides the Disney one. Sure it’s not the book, but it was still pretty dark for its intended audience to the point that I was surprised my pre-school teachers would allow us to watch a film that had the word “jackass” spoken so casually. But then again, I was once raised in a daycare where they allowed us to watch Spaceballs in the third grade. Pinocchio is the story of a wooden puppet brought to life by a blue fairy thanks to the wishes of an old and presumably never-married puppeteer named Gepetto, who wishes for a son because he could never get laid in his lifetime. While his wish comes true in a way, Pinocchio is more of a living puppet than a flesh-and-blood human, and can only become the latter once he’s proven himself brave, truthful, and unselfish. However, there isn’t much of a character arc for Pinocchio to go through in order to achieve his dream because he’s already born with his personality, so the only thing the movie can do is put him in situations that require him to show off these positive traits with the help of Jiminy Cricket. A character who I’m not particularly inclined towards in any way because there’s not much to him other than trying to steer our wooden lead (harharhar) in the right direction for no other reason than he happened to be around when Pinocchio was brought to life. Oh, and people also remember him because of that famous wishing star song he sings. A song I have no particular inclination towards either. Yeah…how can a wooden puppet smoke a cigar? There are three situations that Pinocchio goes through in this film, and yes each one corresponds to a particular requirement. He gets tricked into working with an evil puppetmaster named Strombolli for life, and learns to be truthful after his attempts to dodge responsibility cause his nose to grow long. He gets tricked again into going to Pleasure Island – a cursed location where boys are turned into donkeys to work in mines – and learns to be unselfish after seeing his responsible-free friend Lampwick turn into a literal jackass. The final act has him becoming brave in order to free Gepetto from the belly of a large whale named Monstro. When you get down to it, Pinocchio is pretty much a fucked-up combination of slice-of-life and coming-of-age, and it works well for the most part. 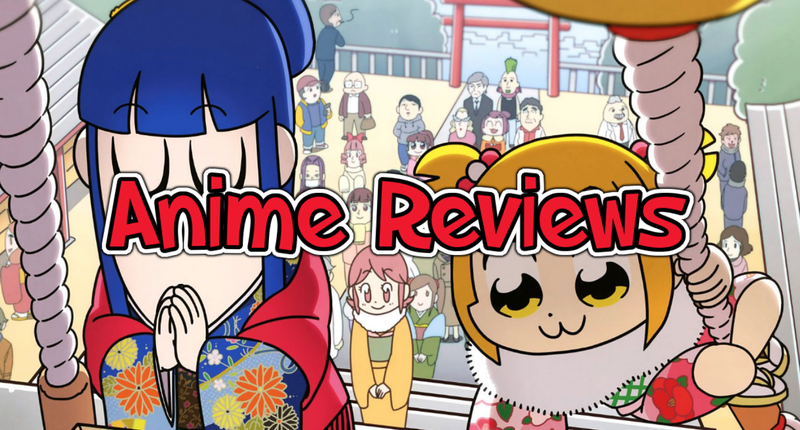 Each act is well-structured for the most part, although given how used I am to anime nowadays, they went by awfully quickly to the point that each situation can come a little underdeveloped. The time between when Pinocchio discovers Monstro and when the “The End” credits show up barely lasts ten minutes. In fact, the entire movie takes place within the span of two days. 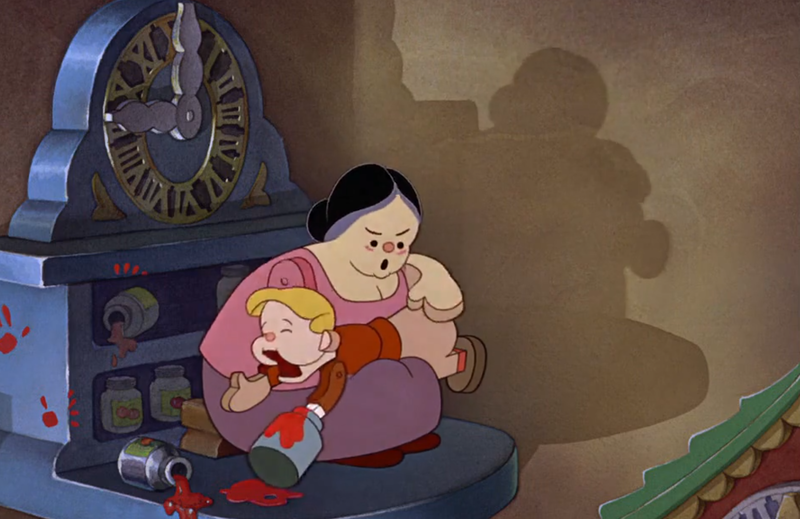 Way to traumatize a new-born, blue fairy. The way Pinocchio’s body works is kind of all over the place. Being made of wood, he shouldn’t really feel things except for stuff like fire, and yet he can get drunk, smoke, and all that other stuff a more clever story would tell him he could experience when he’s real. You see him spin his head around without any physical harm on his part, but Monstro crashing into him appears to kill him? Hell, he can breathe and talk underwater (and so can Jiminy for some reason). But aside from the Strombolli act, the movie mostly treats him like he isn’t a living puppet. In fact, the more I think about it, Pinocchio is pretty much emotion-driven storytelling, isn’t it? It’s not quite as obvious as Snow White, but the movie’s handling of the characters’ growth never really goes beyond “put them in situations and see how they react to it” without much connection between them. We never even get to see much of Gepetto. He only hangs out with Pinocchio for a few minutes in the beginning, a few minutes in the end, and is basically looking for him during the one minute dedicated to showing him in-between. Mufasa, that man is not. As a kid, what I loved the most about Pinocchio were small things like the clocks, the storybook format, and how weird Monstro looked compared to everything else. Something about this film’s visuals just really appealed to my young self, and they still do given the little excitement I felt seeing those multiple alarm clocks go off in unique ways. As an adult, I realize just how disturbing some of the darker imagery is whilst questioning how I survived it. And the donkey act is even creepier to me since we never see those kids again and the coachman is definitely not punished. In fact, none of the villains ever appear after Pinocchio runs away from them. It’s like a Marvel villain round-robin. Except intended to be foreboding in a horror way rather than a cliffhanger-y way. I think there’s a reason why a lot of people mostly associate Pinocchio with this film more than any other: because it’s a dark classic that’s just as fun to watch now as it was back then. Yes, some of the morals are dated and the storytelling is kinda basic, but for kids who want something simpler before they watch a Ghibli film, Pinocchio is a nice watch. Is there anybody who dances the Can-Can anymore? 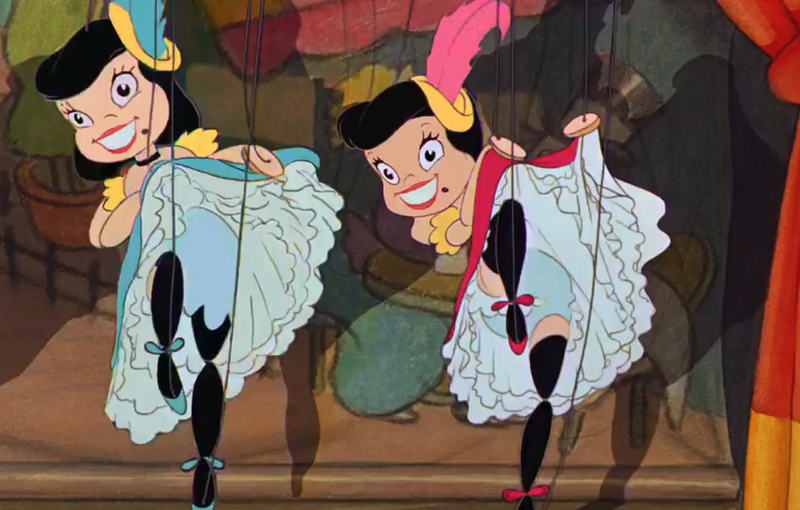 Also, it has female puppets doing the Can-Can. Every kid needs to see that at least once. I never really found it odd that a fox and a cat were just walking around normal people as a kid because that was pretty much the norm for animation growing up (i.e. The Looney Tunes). Did the whole “if you wish hard enough, your dreams will come true” part of the famous song really create controversy? I think the movie itself shows that there’s a little more to it than that. 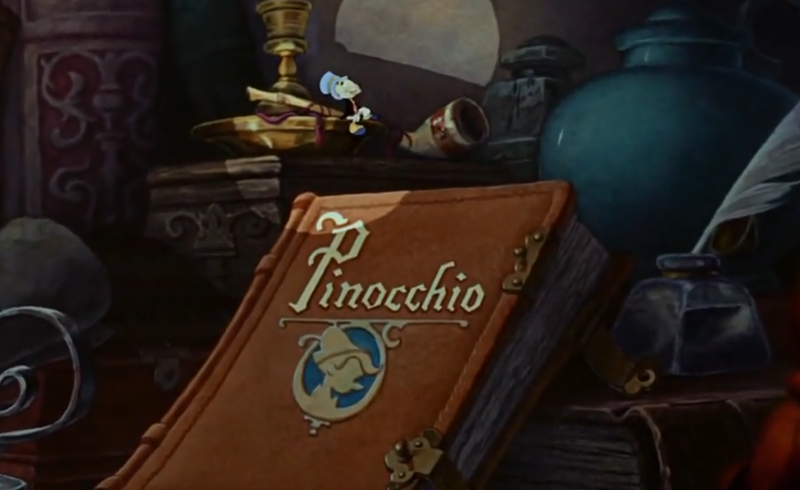 This entry was posted in Anime and tagged disney, movie, Pinocchio. Bookmark the permalink. Virtue’s Last Reward Review — I Went Through The Mindf*** Zone! No jokes, Benigni’s movie is awful. My favourite Pinocchio adaptation is Comencini’s series for the Italian TV – I don’t know if there’s a dubbed version but there ought to be a subtitled one. The original runtime is 6 1-hour episodes and I’d advice that one if at all possible to find, while there also is a recut 2-hour movie version. I think it’s absolutely amazing, very faithful to the source material and when it isn’t pretty much any change it makes is actually an improvement (for example it removes a large part of the sappy morals at the end making it much more stark and matter-of-fact, reflecting the general bleaker tone of the story). It also uses a different approach to Pinocchio’s puppet-to-kid transformations since obviously having an actual puppet running around would have been awkward so he turns into a kid pretty early and him behaving well is the condition to STAY a kid. Which solves a lot of your issues with weird human vulnerabilities while making the whole thing feel very natural and the dangers very real. I’d also add that of course you’d like that mostly if you’d like the book itself, which if you were introduced to by the Disney version might not be the case. For me the book was literally the first thing I ever read so I’m sort of biased there. The original story however is significantly darker than the Disney movie, and Pinocchio himself is far more of a jerk a lot of the time (though it’s also suggested that there are responsibilities from those around him, a world full of adults that are either uncaring, evil or foolish). 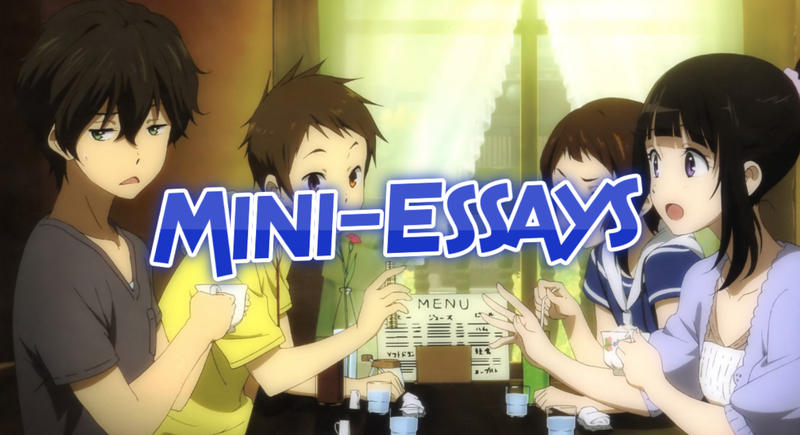 The original format for the novel’s publication was chapter-by-chapter in a magazine so understandably it has a manga-like structure, with regular cliffhangers and somewhat episodic or even disconnected adventures. It was actually supposed to end with Pinocchio’s death when he’s hanged by the Cat & Fox but apparently an editor or the readers’ protests got the author to fix that. I’d say it was a good call if only because it gave us the nightmarish vision that is Pleasure Island – again, a bit that is even worse in the book. Did I mention the part where Pinocchio finds his friend Lampwick still transformed into a donkey, slaving away for a farmer, and tends to him for his last minutes as he expires due to overwork? Yeah, that happens. So, it’s dark. Never read the book itself, but I did know about that part with Lampwick when I looked it up on Wikipedia. No I watched the Benigni adaptation and the one with Jonathan Taylor Thomas. One complaint I’ve seen regarding more recent Disney films is that they’re too afraid of what moral guardians think.